RTÉ chiefs have paid tribute to journalist Kevin Dawson, who has died aged 57. The journalist also worked as a TV producer and commissioning editor and, since 2012, was Head of Editorial Standards at RTÉ. RTÉ Director Dee Forbes today paid tribute to Mr Dawson's bravery in dealing with Motor Neurone Disease. "Ultimately, Kevin’s bravery has left a lasting impression on all his colleagues," Ms Forbes said. She continued; "Kevin Dawson’s contribution to the art of television documentary in Ireland is a significant one. "Working mainly with the independent sector, a Kevin Dawson production was identifiable for its ambition, scale and honesty. Kevin’s documentaries were events. "His final years in RTÉ were characterised by an ethical diligence that was also the hallmark of his earlier journalism. "Ultimately, Kevin’s bravery has left a lasting impression on all his colleagues. He will be much missed." She shared her sincere sympathies with his wife Brianóg, children Colm and Anna, friends and close colleagues. 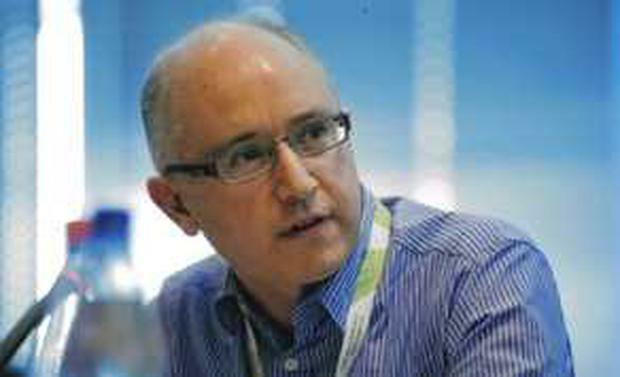 Kevin Dawson’s 35-year career in print and broadcast journalism in Ireland began as a freelance journalist for In Dublin, Magill, Sunday Press, The Irish Times and Irish Independent and then as a senior reporter and news editor with The Sunday Tribune. RTÉ's tribute to Mr Dawson documented his successful career; "To his delight, his time with the Tribune included a 1988 work-study visit on behalf of the paper to The Washington Post, where he met with some heroes including Publisher Katharine Graham, Editor Ben Bradlee and Assistant Managing Editor Bob Woodward. "He first worked for RTÉ as a reporter and presenter in TV Current Affairs from 1992 to 1994 and then until 1998 as a TV producer, notably scripting, producing and co-directing as Executive Producer the landmark history series Rebellion on the events of 1798. "In 1998, Kevin returned to print journalism, as Assistant Editor at The Sunday Business Post, but in 1999 the position of Commissioning Editor Factual TV attracted him back to RTÉ, the focus of his considerable and rigorous energies for ten years. "During that time, he commissioned and developed an unparalleled range of award-winning, popular and critically praised documentaries on history (a subject particularly close to his heart), arts and political subjects. "In 2010 he moved from television to become Head of Corporate Communications and then in 2012 became Head of Editorial Standards, leading the RTÉ Editorial Standards Board with the principled attention to detail and the consideration which epitomised his relationships with colleagues. "His bravery, humility and grace in dealing with Motor Neurone Disease won the heartfelt admiration of the colleagues and friends in RTÉ by whom he will be very deeply missed, not least for his warmth, good humour and - occasionally acerbic - wit."